Easy Audio Downloader can search and download audios from internet. Easy Audio Downloader, striving for excellence in state-of-the-art global technology services, will do our utmost to continue in providing good solutions to meet consumers' need and bring them more excellent software and service. * Total Ease of Use - With fresh, intuitive interface, quick search and specific output, your download will be quick and efficient. * Dynamic Top Rankings - Recommend hot songs sync with USA BILLBOARD HOT 100, UK BILLBORAD HOT 100 and Japan Oricon. * Language Support - Support English,French,German,Italian,Spanish and Russian. * Genre Support - Support Punk,Blues,Rnb,Folk,Emo and others. * Oriental Music - Support Korean,Japanese,Chinese and Thai songs. 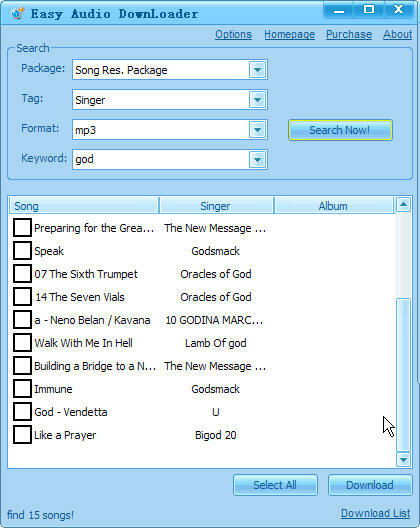 * Audio Format Support - Support mp3,wam,rm and other audio format(based on audio search package in detail). * Enjoy Everywhere - It's portable. you can enjoy the downloads anytime, anywhere you want. Qweas is providing links to Easy Audio Downloader 2.0.0.23 as a courtesy, and makes no representations regarding Easy Audio Downloader or any other applications or any information related thereto. Any questions, complaints or claims regarding this application Easy Audio Downloader 2.0.0.23 must be directed to the appropriate software vendor. You may click the publisher link of Easy Audio Downloader on the top of this page to get more details about the vendor.